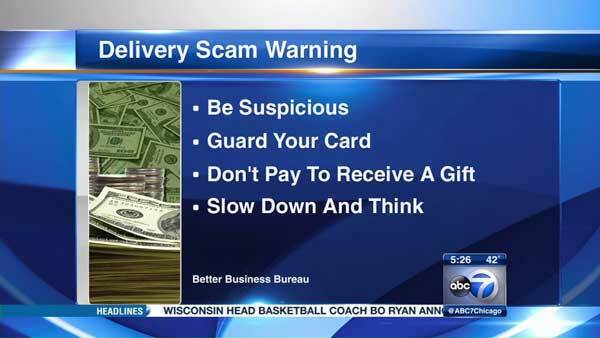 CHICAGO (WLS) -- The Better Business Bureau sent out a warning about thieves taking advantage of the busy delivery season. The BBB said the scammers show up at the door with a "surprise" delivery that requires a "verification fee," which requires credit or debit card information from the recipient. The delivery person has a card scanner on-hand. Here's how to avoid becoming a victim, according to the BBB. First, be suspicious. A friend or family member's gift is likely to be delivered by the U.S. Postal Service, Fed-Ex, UPS or other well-known delivery services. Recipients should question any package from a service they don't recognize. People should guard their cards. Don't give a card to someone who comes to the door. Don't pay to receive a gift. Unless buyers requested the package and expected to pay something, they shouldn't have a fee at delivery. Being asked for an ID is ok, but not a credit or debit card. Finally, slow down and think. BBB President Steve Bernas said thieves take advantage of how busy and distracted people might be this time of year.